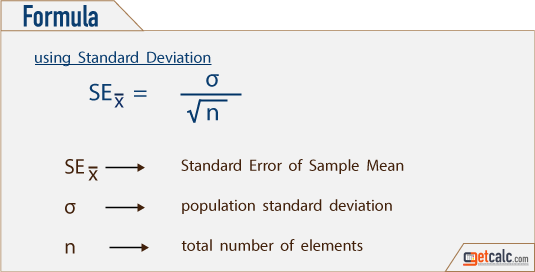 getcalc.com's Standard Error (SE) of mean or proportion calculator to estimate the standard deviation of mean x̄ or proportion p of sampling distribution, difference between two sample means or proportions (using either standard deviation or p value) in statistical surveys & experiments. This calculator featured to generate the step by step work for any corresponding input values to help grade school students to solve standard error worksheet problems online by using standard deviation or without using standard deviation (using p value). In probability & statistics, the standard deviation of sampling distribution of a statistic is called as Standard Error often abbreviated as SE. It shows how effective the selected sample size n is in the statistical experiments or the reliability of experiment results with respect to the sample size. In other words, it's a numerical value that represents standard deviation of the sampling distribution of a statistic for sample mean x̄ or proportion p, difference between two sample means (x̄1 - x̄2) or proportions (p1 - p2) (using either standard deviation or p value) in statistical surveys & experiments. It is one of an important & most frequently used functions in statistics & probability. 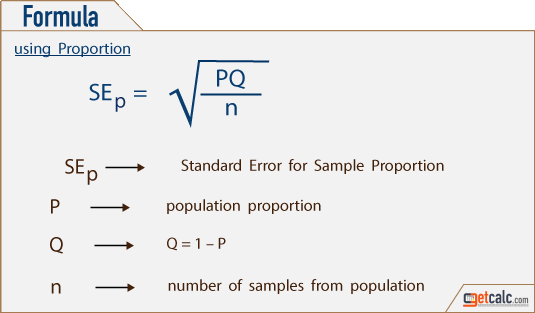 Setup the test of significance or hypothesis for large & small sample size (student's t & Z statistic) to measure the reliability of sample & population parameter and the estimation the confidence interval for population parameter are some of the major applications of standard error. It's a statistic measure calculated from the sampling distributions where the large size samples or proportions reduces the SE of a statistic proportionally and vice versa. For quick calculations & reference, users may use this SE calculator to estimate or generate the complete work with steps for SE of sample mean (x̄), SE of sample proportion (p), difference between two sample means (x̄1 - x̄2) & difference between two sample proportions (p1 - p2). 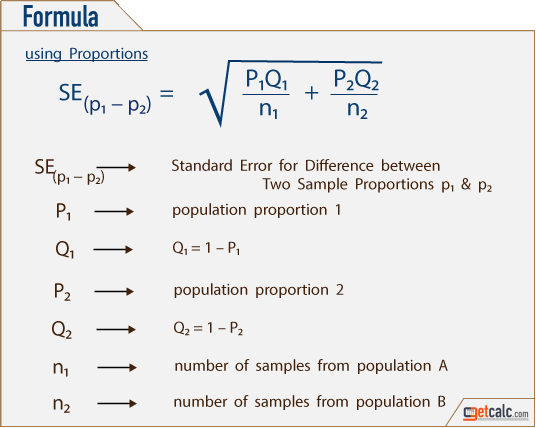 In the theory of statistics & probability, the below formulas are the mathematical representation to estimate the standard error (SE) of sample mean (x̄), sample proportion (p), difference between two sample means (x̄1 - x̄2) & difference between two sample proportions (p1 - p2). Refer these below formulas to know what are all the input parameters of standard error for different test scenarios. Users can also check if the results are reliable for a chosen sample size n by using this standard error calculator. This standard error (SE) calculator featured to generate the complete work with steps for any corresponding input values for sample mean (using standard deviation), difference between two means (using standard deviation), sample proportion (using p value) and difference between two proportions (using p values) to solve the grade school standard error statistic workout problems. Supply the input values, click on "CALCULATE" button and then "Generate Workout" to generate the complete work with steps for the input given to this SE calculator. The below are the solved examples for standard error (SE) statistic calculation by using standard deviation or without using standard deviation.